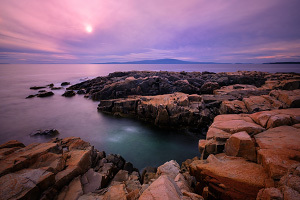 Located on the Schoodic Peninsula just north of Schoodic Point, the Schoodic Education and Research Center is home to the Schoodic Institute, a non-profit partner of Acadia National Park that supports researchers, classes, and conferences. (The campus was formerly a U.S. Navy Base listening station until it was closed in 2002 and the land was returned to NPS control.) Starting on the edge of the campus, the Sundew Trail is a lovely nature trail that heads through the thick forest to provide access to the coastline at three separate spots. This hike is an easy family stroll and may take 30-90 minutes to complete, but since the spots along the coastline are so inviting, allow more time to leisurely explore and enjoy. 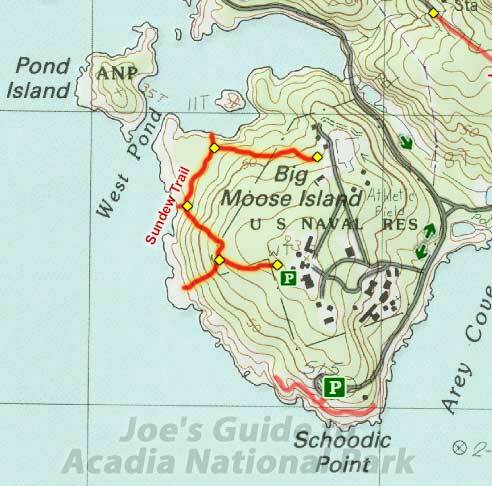 To find the trailhead, drive along the one-way Schoodic Loop Road and turn right (south) onto Schoodic Point Road (the two-way spur road that heads to Schoodic Point). Roughly .3 miles from the junction, turn right to enter the Schoodic Education and Research Center campus. Follow Acadia Drive and then Musetti Drive west to the large south parking lot; a light-green water tower can be seen behind Eliot Hall. Park and find the Sundew Trail trailhead marker at the northwest end of the parking lot at the edge of the forest. The Sundew Trail is well-maintained and is very easy to follow. 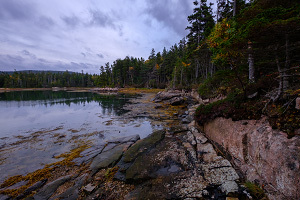 After only .2 miles in the forest, you will reach the junction with the first spur trail; follow it for access to a beautiful section of rocky coastline similar to the nearby Schoodic Point. This spot offers a wonderful view of Mount Desert Island in the distance and much like Schoodic Point, it's fun to wander along the large granite formations. Back on the main trail, you will soon reach the second coastal access point with a much different feel, a beach made up of large pieces of loose pink granite that also invite exploration. And a bit further down the trail, you will reach the junction with the spur trail to the third access point: a view north into the calm and secluded West Pond Cove. Trees come right up to the shore here, so it's not as easy to explore the coastline here. The main trail loops around and ends at the north end of the SERC campus at a small trailhead pavilion. You can either retrace your steps on the Sundew Trail or walk the roads through campus back to your car. While this hike might be a bit off the radar, it really is a terrific little trail with some very sublime forest and coastal scenery. If you have already been to Schoodic Point and want to soak in a bit more of that luscious granite coastline, this is an excellent diversion.